In May of 2014, Dr. Rodney J. Decker passed away. He taught at Baptist Bible Seminary (PA) and specialized in the study of Greek. 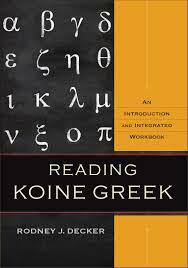 He had completed a new textbook which has now been published by Baker called Reading Koine Greek. I have always been interested in Greek, and I have taught Greek a number of times, having used four different textbooks. Often it seems that the best writers often don’t have the in-depth and up-to-date knowledge of linguistics. Decker is a bit unique in demonstrating a career of experience and knowledge in research, as well as mastering teaching techniques and tools. Here are some features of this book that stood out to me. Modern Linguistics – Decker notes that many students and even NT scholars are simply not current with insights from modern linguistics. He tries to introduce these insights into the textbook in a way not often found in Greek grammars. LXX – Decker has readings and exercises that come from, not just the NT, but important related texts including the Septuagint. Personally, I really like that. Visual Appeal – the book is extremely well-produced, with attractive visual layout – this is important particularly for a grammar. Mnemonic devices – I love that Decker includes a lot of mnenomic devices for memorizing things. How do you remember the Greek word for “one” – hen? “Steal me one chicken” – hen = one, steal is like “heist” and thus heis. You get the picture (p. 205). Verbal aspect – Decker endorses a Porter-ian approach to VA, so know that that is what the students would be learning. What I liked about this (I don’t necessarily agree with him) is that he introduces it in a clear way. LoTR – Clearly Decker loves the Lord of the Rings. He takes the time to quote Gandalf in an illustration. Caution – I do want to note one caution I had about using this book – Decker resists using traditional fill-in-the-blank exercises, so you don’t really have them. He gives sample readings from the New Testament that can be teaching and learning moments. My impression is that if I were to use this textbook, I would want to create my own homework sheets. Is this the best Greek textbook to use? It is really a matter of preference of learning style, approach to Greek issues (like verbal aspect), and level of student. I would definitely say that a Greek teacher ought to look at the loads of excellent teaching tools and tips that Decker offers. I would definitely be interested in hearing from folks that are using this in class (faculty and students). Rest in Peace, Rodney J. Decker. Baker made some really handy Quizlet decks for this book! Vocab and parsings.